The concept of patronage was closely linked in Mr. Lincoln’s mind to the concept of friendship – as Mr. Lincoln’s abortive attempt to be named commissioner of public lands demonstrated. In 1848, Congressman Lincoln campaigned hard for General Zachary Taylor – both before and after the Whig National Convention that drafted him. In 1849 after Taylor election, outgoing Congressman Lincoln became tangled in a bitter patronage fight for the General Land Office. Mr. Lincoln was deeply involved in trying to secure patronage positions for Illinois Whigs. 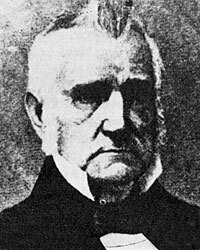 The situation was complicated by a difference of opinion between Mr. Lincoln and his friend, newly-elected Whig Congressman Edward D. Baker. Don Seitz wrote that “Lincoln’s correspondence abounds in letters of endorsement for various citizens of his State. He was firm for weeding out diligent Democrats, but it is hard to learn his exact attitude toward gathering the land office plum.”1 Shortly before leaving Washington for Illinois, Congressman Lincoln wrote Secretary of War G. W. Crawford: “There is not now a sin[gle] Whig Clerk from Illinois in any of the D[epart]ments here unless it be J. M. Lucas, recen[tly] appointed by Judge Young in the Land Offic[e].” Mr. Lincoln then recommended three potential Whig clerks “of good habits and unimpeachable [mor]al character.”2 One of those he recommended was a fellow attorney and former editor of the Tazewell Whig. Mr. Lincoln tried to comport himself in a manner consistent with friendship. And yet he presumed upon friendship in the many letters he wrote seeking support for his own appointment. “It is now certain that either Mr. Butterfield or I will be commissioner of the general land office. If you are willing to give me the preference, please write me to that effect,” wrote Mr. Lincoln in a typical letter to Dr. Joseph B. Herrick. He wrote attorney Josiah M. Lucas: “Like you, I fear the Land Office is not going as it should; but I know nothing I can do. In my letter written three days ago, I told you the Department understands my wishes. As to Butterfield, he is my personal friend, and is qualified to do the duties of the office; but of the quite one hundred Illinoisians, equally well qualified, I do not know one with less claims to it.”5 Mr. Lincoln wrote Indiana Congressman Elisha Embree for a “favor” which “I hope will not cost you much”. He said the potential appointment of Butterfield an “egregious political blunder. It will give offence to the whole whig party here, and be worse than a dead loss the administration, of so much of it’s patronage. Now, you can conscientiously do so, I wish you to write General Taylor at once, saying that either I, or the man I recommend, should, in your opinion, be appointed to that office, if any one from Illinois shall be.”6 He closed the letter “Your friend as ever.” He sent a nearly identical letter to Indiana Congressman Richard W. Thompson. Judge David Davis contradicted friends who told Mr. Lincoln had that he would be sacrificing his legal career if he pursued the Land Office. “My advice is worth nothing. Still were I in your place, could I get it, I would take the Land Office.” He warned Mr. Lincoln that the practice of laws “at present promises you but poor remuneration for the labor.”10 When he finally decided to pursue the Land Office appointment, Mr. Lincoln employed friends like Davis to lobby on his behalf. Don C. Seitz, Lincoln the Politician, p. 81. King V. Hostick, “Lincoln Seeks Patronage for Illinois Whigs: A New Letter”, The Lincoln Herald, Winter 1969, p. 144 (Letter to G.W. 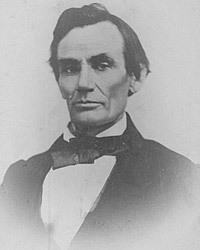 Crawford, March 11, 1849). Roy P. Basler, editor, The Collected Works of Abraham Lincoln, Volume II, p. 42-43 (Letter to William B. Preston, April 20,1849). Roy P. Basler, editor, The Collected Works of Abraham Lincoln, First Supplement, p. 14 (Letter to David Davis, February 12, 1849). Roy P. Basler, editor, The Collected Works of Abraham Lincoln, Volume II, p. 43 (Letter to Josiah M. Lucas, April 25, 1849). Roy P. Basler, editor, The Collected Works of Abraham Lincoln, Volume II, p. 51 (Letter to Elisha Embree, May 25, 1849). Roy P. Basler, editor, The Collected Works of Abraham Lincoln, Volume II, p. 49-50 (Letter to Duff Green, May 18, 1849). Roy P. Basler, editor, The Collected Works of Abraham Lincoln, Volume II, p. 28-29 (Letter to Joshua F. Speed, February 20, 1849). Roy P. Basler, editor, The Collected Works of Abraham Lincoln, Volume II, p. 48 (Letter to William B. Preston, May 16, 1849). Willard L. King, Lincoln’s Manager, David Davis, p. 64-65 (Letter of David Davis to Abraham Lincoln, February 2, 1859). William Lee Miller, Lincoln’s Virtues, p. 221. Roy P. Basler, editor, The Collected Works of Abraham Lincoln, Second Supplement, p. 1-2 (Letter to Moses Hampton, June 1, 1849). Abraham Lincoln Papers at the Library of Congress. Transcribed and Annotated by the Lincoln Studies Center, Knox College. Galesburg, Illinois. (Letter from Cyrus Edwards to Abraham Lincoln, April 15, 1849). Roy P. Basler, editor, The Collected Works of Abraham Lincoln, Second Supplement, p. 2-3 (Letter to Thomas Ewing, June 22, 1849). Roy P. Basler, editor, The Collected Works of Abraham Lincoln, First Supplement, p. 15-16 (Letter to David Davis, July 6, 1846). Roy P. Basler, editor, The Collected Works of Abraham Lincoln, Volume II, p. 78 (Letter to Thomas Ewing, March 22,1850). Roy P. Basler, editor, The Collected Works of Abraham Lincoln, Volume II, p. 57-59 (Letter to Joseph Gillespie, July 13, 1849). Roy P. Basler, editor, The Collected Works of Abraham Lincoln, Volume II, p. 57 (Letter to Joseph Gillespie, July 13, 1849). Ida M. Tarbell, The Life of Abraham Lincoln, Volume I, p. 231. Francis Fisher Browne, The Every-day Life of Abraham Lincoln, p. 198. Roy P. Basler, editor, The Collected Works of Abraham Lincoln, Volume II, p. 83-90.